Year after year, NuSmile Pediatric Crowns look better and last longer than other restorative options and competing brands. Manufactured with only the highest quality materials, NuSmile crowns use the latest generation proprietary processes and patent pending technologies to ensure a long-lasting, great looking restoration every time. 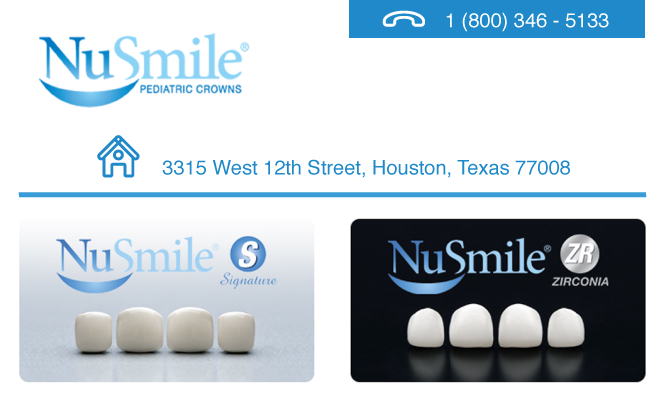 NuSmile pediatric crowns are available in two styles, NuSmile Signature and NuSmile ZR. NuSmile Signature crowns are anatomically correct, stainless steel crowns with a natural-looking, tooth-colored coating.NuSmile Signature crowns are a widely used, dependable and easy restorative option to traditional stainless steel and composite strip crowns. NuSmile ZR is the next generation in pediatric restorative technology and represents the perfect balance of art and science. Made from zirconia ceramic, NuSmile ZR offers high-end esthetics, superior durability and easy placement compared to composite restorations and strip crowns. Since 1991, proven results you can count on – known by leading clinicians and backed by university studies. Keeping up with kids is what we do.